Choose either Teacher or Student . Select either to Create a new project or Manage an existing project. If you create a new project, give your project a unique name and then type in a password for you to manage the project. If the name already exists, you will get an error and you will need to rename it. If you manage an existing project, you will be asked for the project name and password. Once you are successful in either creating or logging into a previous project, give your project a name, a subtitle (could be a simple one line instruction), the author of the text, and a citation. Type in or paste your text into the Text to Annotate box at the bottom of the page. There are some font, text, and pasting options in the toolbar at the top of the box. There are a series of highlighters along the left side of the page. Label the colours to match what you would like the students to use that colour for. Only the colours you label will be available for the students when they log in. At the top of the page, there is a Project Instructions button. You can use that to enter instructions for the students. Once you are done editing, click on the Save button. You can also choose to Save and Send Email, but I wouldn’t suggest it. 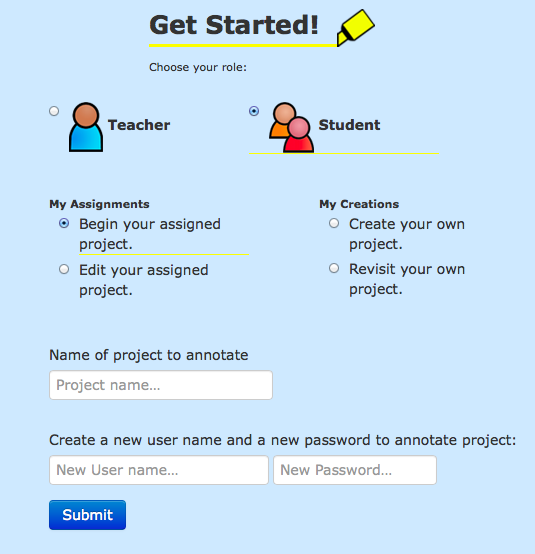 Once you are ready to have students annotate the text, give them the main page link along with the project name. Students who visit the main page, click on the Student button and then select Begin your assigned project. They can then enter the project name you have given them and create a new username and password for themselves. This can be used to log back in to edit the project at a later time. To highlight a word, students choose a colour and then just click on the word. You can’t click and drag lick other programs. If you want to highlight multiple words, you click on the first word and then click on the last word. Everything in-between will be highlighted in that colour. Once you highlight something, a box will come up and give you a chance to label your annotation with text. Student can either just save the project to edit later, or can save and submit to the teacher for review. The teacher can then log in and click on Student Submissions to review them and add comments. If you do add comments for the students, make sure to click on Save Comments before leaving the page. While this isn’t the most comprehensive of the annotation tools I have used, it provides a safe place for students to use without having to give any personal information away (ex. email address). I also like the labels for the various colours. It’s also quite simple for students and teachers to use. You can also find hundreds more webtools that don’t require student registration on my list here. Let me know what you think and share your ideas for how you might use it in the classroom by adding your comments below. Thank you!